Sometimes Mr Craft asks me to make cards. Luckily he usually has an idea of what he would like, and this occasion was no different. One of his colleagues was leaving and rather than a traditional good luck card he created one based on her new job. 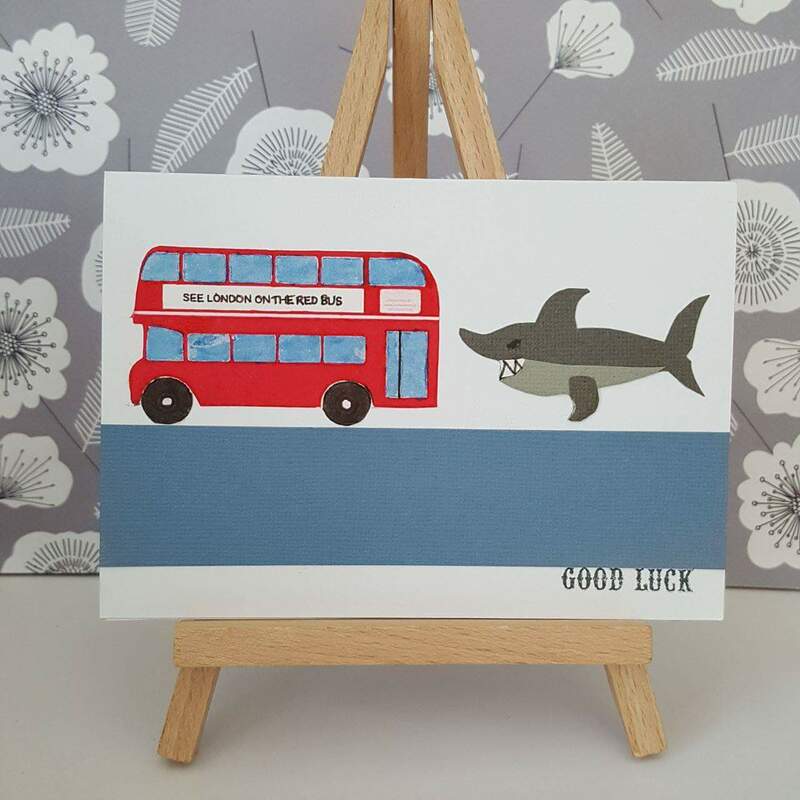 She’s going to do something to do with buses in London and her worst fear is being chased by a shark, so he thought he’d ask me to make a nice cheering card combining the two. I’m sure she’ll be thrilled! Normally I don’t mind making things like this, in fact I rather enjoy it. However, this time I didn’t have the things needed. I have nothing shark or bus related so had to print some. Easy peasy! Or not. My printer had an error code so I had to Google how to sort it, reset it and then print again. A bit of a disaster given that I started it 2 hours before he needed to take it to work with him. Finally it printed, in bloody pink! Pink! Not London bus coloured at all. Me and the printer were well and truly divorced by that point so I coloured it. What a stupid idea. The pens bled into the paper and made it look scruffy. I cut it out and decided it was as good as it was going to get. Having abandoned the printer, I searched for images of sharks, drew one onto tracing paper and traced it into grey card. I cut it out using decoupage scissors and then traced other parts of it onto lighter grey and white for the teeth before assembling the layers. I was pretty pleased with the shark actually! I stamped the obligatory good luck sentiment, but managed to get ink on the card so had to add a coloured strip to cover it up. What’s the weirdest card or craft you’ve ever been asked to make? I hate when you need to get something done in short order and something you need picks that time to break down. I like your shark too! It’s such a pain isn’t it. I rarely print anyway as ink is so expensive so maybe it’s just in a mood about not being used. Who knows? I love cards like this, that cause a bit of head-scratching confusion for most but mean the world to the recipient because they are so truly personal. Plus, the shark rocks! Thanks, I can’t imagine there’s a huge demand for such ‘interesting’ ones! Well granted, maybe not for a range in Clintons, but it shows great versatility and creativity! And it was a really good shark! He was pretty cute considering I had to copy an image from my phone! Quite fun to make him too. I’m not predicting a career designing for Clinton’s either 😂 I blame Mr Craft. That’s an awesome-looking card. Why not do some card-ordering business? My weirdest card was to write to my fiance that she was my first love. I had told her about the only girl I ever loved but she insisted I was her first love so I went ahead and admitted she was my first love. I love making very personal cards like this. You did a great job! What a great idea 🙂 love the shark it looks so good! Thank you, apparently the lady thought it was very funny too! It’s super cute, even with all the troubles! Just when I need it most & fastest, my printer conks out on me, too. I love your creative problem solving to get from printer catastrophe to a great-looking finished card! I love the shark and the bus – yes, really, the bus too: hand coloring give it more depth & vibrancy IMO. Thank you! I often have to add a bit to cover where I’ve messed up!